Here we are at the end of another beautiful day, we hope you are enjoying the weather as much as we are. After an early start, Karen has made excellent progress on the door today. We think it was the comment about going to the beach that has spurred her on! As the door had so many coats of paint on, a second application of the eco friendly paint stripper made light work of the remaining paint. 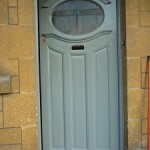 Painting (or undercoating) a panelled door is best done in a particular order. This applies to any type of panelled door as it enables you to stop if necessary – to have a cup of tea for example! Have at look at this project to see how. Do you need someone to paint your door? Unfortunately, Karen isn’t free, but you can click here to find a local tradesman who can!